For over 30 years now, the Montpelier tree removal professionals at C.S. Flournoy have been providing the highest quality tree services for home and business owners alike in Montpelier and the surrounding communities. We are specialized in a wide variety of different Richmond tree services that include, complete tree removal, land clearing and grading, stump grinding, bush hog mowing, and a whole host of other tree and landscape care services. 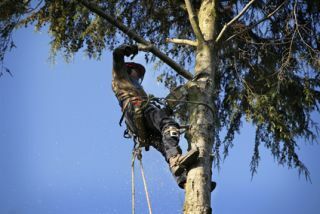 We are a fully licensed and certified arborist contractor for the Montpelier area, we have a great deal of experience in just about every type of service in our industry, ranging from the smallest and most simple, to expansive and complex. You can always count on us for fast and efficient service, dependable work you can count on, and fair and affordable rates that won't break your budget. Here at C.S. Flournoy, we take great pride in our ability to offer up the best service possible with a rapid response time and safe, quality work, at an extremely affordable rate. Our team of made up of fully trained and highly experienced professionals, including a certified arborist on staff at all times. Our team of experts are always ready, willing, and more than capable of taking care of any tree service you need performed, no matter the size or level of complexity. We also welcome insurance claims, and can even help you through the process and provide the assistance you need to get your home back in working order as quickly as possible. If you have any questions about our full line of tree care and removal services, or you would just like to schedule an appointment for professional consultation, give our team of experts a call today. We are always standing by and willing to help in whatever way we can. We look forward to working with you. If you are looking for a way to make your trees look healthier all year long, our line of tree feeding services might be just what you're looking for. From younger trees to older ones, our experts know exactly what care to provide so that your trees can continue looking their best. If you are looking for a Montpelier Tree Removal Company then please call 804-264-1000 or complete our online request form.